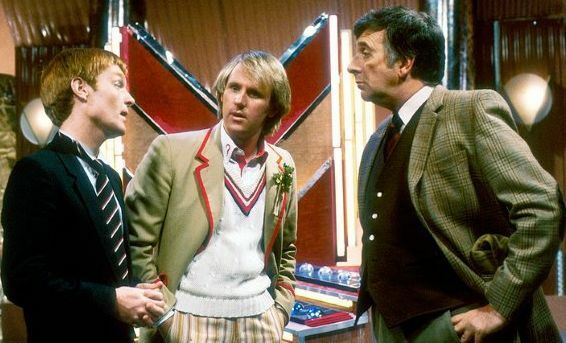 There’s several notable things about Mawdryn Undead (such as the return of the Black Guardian and the introduction of Turlough) but let’s be honest – for most of us it’s all about The Brig. Nicholas Courtney holds a unique place in Doctor Who history. No other actor played the same character opposite six of the first seven television Doctors and there would be several post-Battlefield appearances as well. Such as Dimensions in Time (oh dear), Downtime (quite good really) and a last hurrah opposite Elisabeth Sladen in The Sarah Jane Adventures. Before we move on to look at Mawdryn Undead, I would heartily recommend the audiobook of his memoirs, A Soldier In Time, produced by Big Finish. There’s plenty of time spent discussing Doctor Who of course, but by far the most interesting section is devoted to his childhood and his early years as a struggling actor. Courtney’s familiar Doctor Who stories (“five rounds rapid”, “they were all wearing eyepatches”) are part of Doctor Who folklore, but where A Soldier In Time really excels is in showing us something of the real man. Let’s take a quick look at Babelcolour’s lovely tribute (which I can never watch without getting a little misty-eyed) then we’ll turn our attention to Peter Grimwade’s second script for the series. 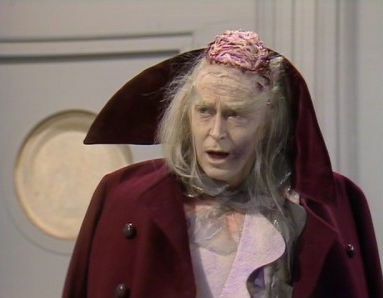 It seems that Mawdryn Undead was originally planned with Ian Chesterton in mind, which makes sense, as it’s possible to imagine Chesterton in later years teaching at a boys school. But for whatever reason it was redrafted for Lethbridge-Stewart. It had been eight years since the Brigadier had appeared in Doctor Who, with only one of his stories repeated during this time (The Three Doctors in 1981) and for many, including myself, this would only be our second opportunity to see him in action. But we all knew how important he was to the series (both through DWM and also by reading about his earlier stories in Target Books’ series of novelisations). Initially, we’re presented with a somewhat broken-down and dispirited Brigadier which is a far cry from the resolute, man of action of the Pertwee era. Like much of the story, there’s something of a NuWho feel about this, as it’s impossible to imagine any regular character during the 1960’s or 1970’s being put under the microscope in such a way, whereas it’s much more likely to happen today. Lethbridge-Stewart seems to be suffering from some deep-rooted trauma, as he doesn’t remember either the Doctor or the TARDIS. Eventually the Doctor manages to break through, which leads us into a gloriously nostalgic clip-fest. This was a regular feature of the early JNT years (there were similar examples in Logopolis and Earthshock). You had to be there, but at the time this was so incredibly exciting. The notion of being able to even see, let alone own, every Doctor Who story in existence was almost beyond imagining so these brief clips were tantalising glimpses into an unknowable, magical past. Courtney’s wonderful in these scenes, they give him so much more to work with than he’s ever had before. And just as we’ve grown used to this Brigadier, we’re introduced to another (from six years earlier). This is a pre-breakdown Brig, much closer to the character we saw in, say, Terror of the Zygons. The two Brigs (one from 1977 and the other from 1983) become central to the story, and the consequences of time travel is another element of the story which is NuWho flavoured. The original series rarely used time travel as part of the story. The TARDIS mainly existed to drop the Doctor and his friends off somewhere and would take them away at the end of the story, although there were exceptions of course. In The Time Meddler, Steven and Vikki discuss what would happen if the Monk succeeded in changing history – would their memories of events just change and would they even realise that they had? In The Ark we see the results of the Doctor’s actions, when the TARDIS returns to the Ark several hundred years after his last visit. Dodo’s cold triggered a chain of events that led to the Monoids taking control and subjugating the humans. Perhaps the story with the closest link to Mawdryn Undead is Day of the Daleks. In Day, two separate times become connected, which means that the events of the present are inexorably linked with the future. Something similar happens here, with the crux of the story resting on the connection of the two Brigadiers. In retrospect, it’s not difficult to understand why time travel didn’t feature in more stories during the original series. Once you’ve uncorked that particular genie, it’s impossible to get it back into the bottle. For example, at the start of Time-Flight, Tegan asked the Doctor why they couldn’t land the TARDIS on the freighter and rescue Adric before it crashed into the Earth. The real reason was that Matthew Waterhouse’s contract was up and it wasn’t renewed – but the moment you introduce the idea that all the Doctor has to do to solve matters is to nip back in the TARDIS, you’re on very shaky ground. The Paul McGann TV Movie (or as I prefer to call it, Grace 1999) has a particularly bad example of this, when Grace is brought back to life. When life and death are not absolute (and the new series has often been guilty of this – how many times have the dead been resurrected?) the narrative has to suffer. As I said earlier, there are a few other notable things about Mawdryn Undead. Firstly, Mark Strickson is introduced as Turlough. It’s interesting that JNT decided to introduce another male companion so soon after Adric. The heyday of the male companion was in the 1960’s where they generally performed the strong-arm stuff that the Doctor was either unable (Hartnell) or unwilling (Troughton) to do. Later on, as Jon Pertwee and Tom Baker were able to handle their own action, the likes of Harry ended up as something of a third wheel. 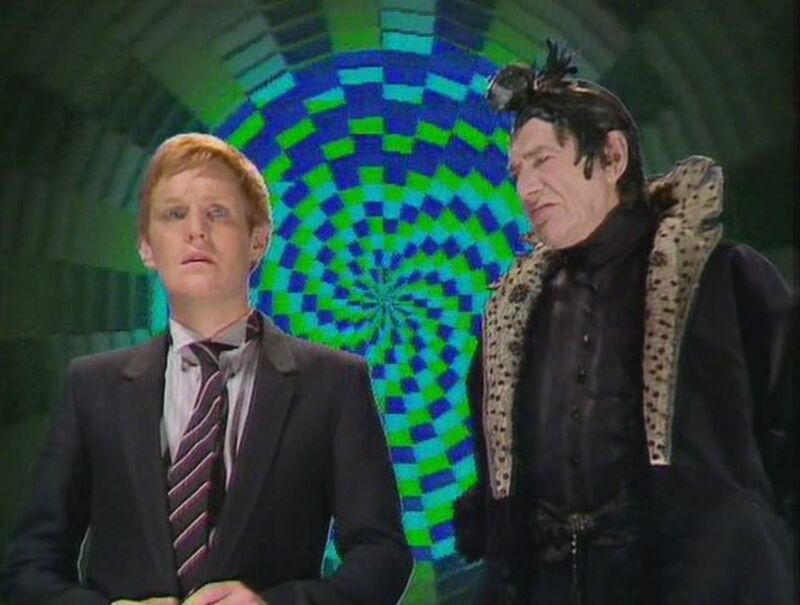 During his first three stories, Turlough has an interesting story arc – he’s an agent of the Black Guardian and has been ordered to kill the Doctor. Even before he’s recruited we can clearly see he’s a bit of a wrong ‘un, so his presence in the TARDIS will certainly shake things up. Strickson’s very good here as he would be during his brief run on the programme. After the Black Guardian trilogy he’s very often sidelined, but whenever he’s given something to do (Frontios, for example) he delivers the goods. The next item of interest is the return the Black Guardian. I love Valentine Dyall and could listen to his voice forever – but the Black Guardian is a really rubbish villain. Although the threat of the Black Guardian had hung over The Key To Time season, he only appeared in one short scene. And a problem with the Black Guardian trilogy is that after we’ve seen him pop up once and threaten Turlough with dire consequences if he doesn’t kill the Doctor, then we’ve seen everything he can do. You’ve also got to wonder why the Black Guardian, charged with creating universal chaos, should be concerned with destroying the Doctor. And why he couldn’t recruit somebody better than Turlough. Surely there must be more efficient killers out there? 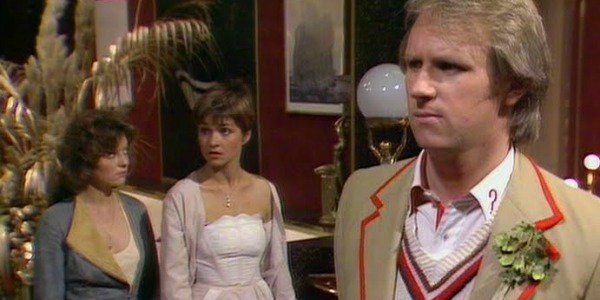 Whilst the Doctor, Nyssa and Tegan are busily interacting with the Brigadier and Turlough the main plot is taking shape. Unusually, there’s a very low level of threat for the Doctor and his friends. Mawdryn and his friends are criminals (they stole regenerative equipment from Gallifrey, although how they got past the Transduction Barriers is anyone’s guess) but they don’t actively wish anybody any harm – they just want to die. The debate about assisted suicide carries on today and it’s surprising to see it addressed some thirty years ago in Doctor Who. The Doctor could help (but this would mean surrendering his remaining regenerations). He declines, although changes his mind later on when he discovers Nyssa and Tegan have been infected. 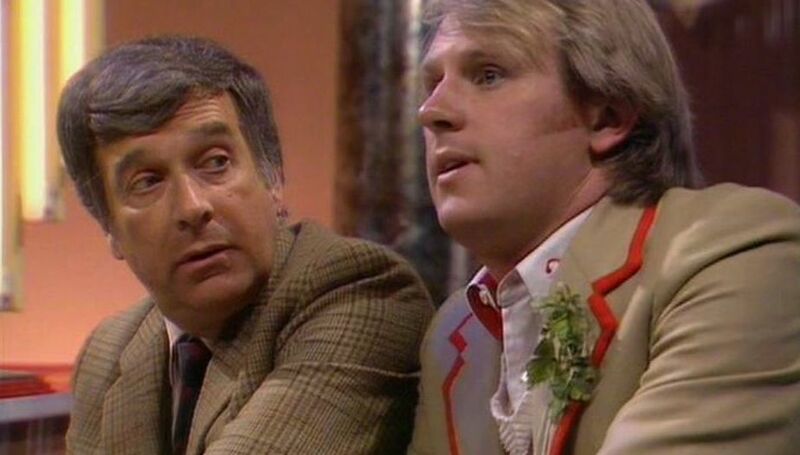 Luckily for everyone, the two Brigadiers chance to meet at just the right moment with the result that Mawdryn and his friends are able to die, Nyssa and Tegan are cured and the Doctor remains a Time Lord. A quick mention for David Collings as Mawdryn. He’s sometimes hampered by the make-up and costume but he’s very compelling as the weary, resigned scientist locked into an eternal life of torment. It’s easy to see why so many people would have liked to see him play the Doctor (check out his appearances in Sapphire and Steel, where he plays Silver in a very Doctorish way). Season 20 could have just loaded each story with classic monsters and it probably would have worked quite well. But I’m glad that they didn’t and instead there’s a wider range of stories and themes of which Mawdryn Undead is a fine example.